Marine based seaweed liquid that revitalizes the body, nourishes, energises and moisturises the skin, reducing minor skin irritations, spots and blemishes. Promoting overall wellbeing. 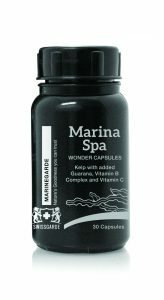 Marina Spa Wonder capsules are a unique kelp-based formulation enriched with Guarana, Vitamin B complex and Vitamin C for a daily nutrient-dense wellness boost.